Holiday travel is winding down for many of us. Throughout the holiday season and all through the year, many pet parents and their fur babies are in vehicles scurrying about, bustling here and there, packing up and preparing to go see family and friends for holidays, vacations, or just to run errands around town. Most people with dogs love to bring them along on their adventures. In fact, a recent survey said that 5 out of 6 dogs went 'on the road' this past holiday season! 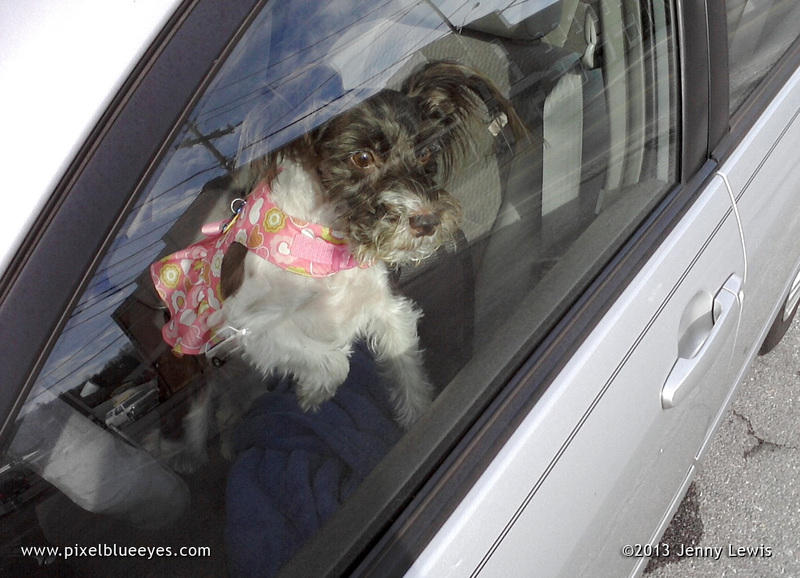 How often have you thought about your dog's safety in the car? I know you are all excellent pet parents, but sometimes pet vehicle safety is an uncertain subject. 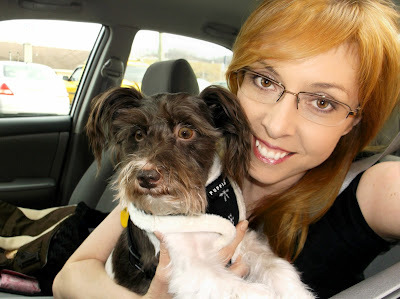 That is why we have National Pet Travel Safety Day, and why I wanted to share some helpful information to prepare you for some of the hazards and distractions that can occur when travelling with one or more dogs in a vehicle. Many dogs are very good in the vehicle when it is moving, however distractions can come in a moment's notice. For example, I'm excellent in the car for Mommy, however I have a weakness once we get into town and come to a stop light close to a parking lot. If someone looks in the car wrong, or if someone is walking 3 blocks away with their back to me, I sound the alarm and start howling...startling the dickens out of all car passengers. It's just the Schnauzer in me and something Mommy and I are constantly working on. However, if I wasn't sitting securely with my seat belt on, and someone perhaps hit the car from behind, I could go get knocked off my feet in the car, fall down or go flying. 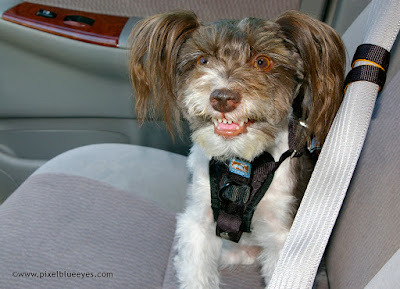 All dogs should be secured in one form or another while the car is in motion to ensure the safety of both the dogs, the drivers and the passengers. 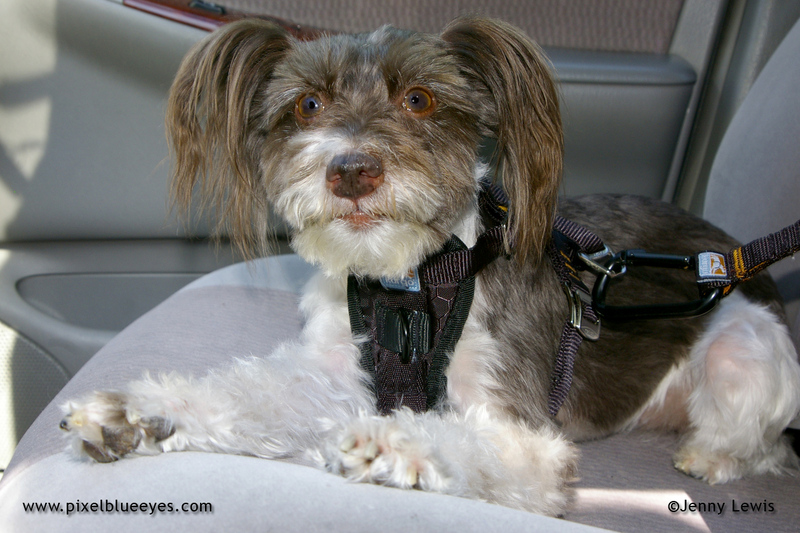 When I travel in the car, I always wear my Kurgo Tru-Fit Smart Seat Belt Harness so that I am secure in the vehicle at all times. (You can read my detailed review of the Kurgo Tru-Fit Seat Belt Harness here.) 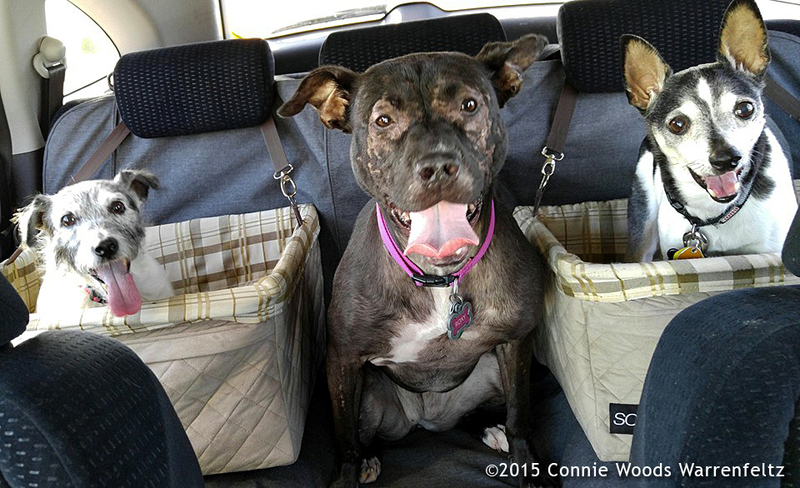 Some dogs travel in car seats, like my friends Arlie Jo and her brother Irvin. Her sister Roxy sits securely in the middle. Arlie Jo's Mom Connie takes them every Sunday for Cheeseburgers. It's a very special outing that they all love, as you can tell by their faces in this photo! I say that car safety is of the utmost importance because if, God forbid, a car accident does occur, both pets and humans can become tragically injured. Pets also can also easily become lost after a car accident. We've seen this time and again. Mommy has personally helped several families who lost beloved pet family members who were not secured in a moving car. Their dogs either escaped or got thrown from the car during an accident, ran off and several did not have a happy reunion ending. These tragic true stories have made Mommy overwhelmingly avid about making sure I am safe in the car. 1. Make sure your pet wears a harness/collar with identification on it. THIS IS MY MOST IMPORTANT TIP. Make sure the ID tags include Pet Name, Pet Parent Name, Address, at least 2 Phone Numbers, and Vet Name (if you have the room), plus anything else that might be helpful. I have a two sided ID tag that allows all that information to be printed on it. PetTags4Less.com is one website with double sided aluminum ID tags for dogs that come in many styles and colors. Mommy won't even let me walk out of the house, she won't even carry me out of the house unless I'm wearing identification that is not easily removable. If I were to get lost during a car accident, that ID tag could people bring me home. 2. Once inside the vehicle, make sure your pet is secured to the seat either straight to the seat belt or in a car seat, which should be securely attached to the seat or seat belt as well. Don't let them walk or jump around inside a moving vehicle. That is very dangerous for all involved, no matter how skilled a driver you may be. 3. Don't let your pet hang their head outside the window while driving (no matter how fun or cute it is). Think of what could happen if a stray rock or worse flew into your dog's eye or face. And the intense wind is not good for our lungs in all honesty either. Sad but true. 4. Make sure to carry fresh water and a small drinking bowl for your pet so they can have a fresh drink any time you stop. 5. Try not to have your pet travel on a full stomach. If they are nervous travelers or have queasy stomachs, you don't want to see their lunch come back on your seat. If you must feed them, feed them lightly so their hunger is satisfied but save any full meal for later after you are off the road, unless that cannot be avoided. 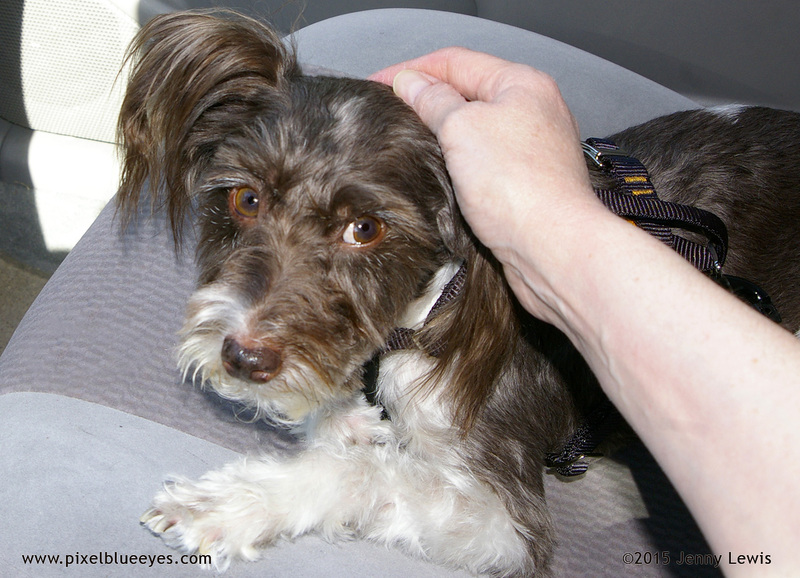 Some dogs love traveling in the car, others get very nervous. Some pets might start out very nervous about traveling when they are young, but end up loving every second of a car ride. And yet still other dogs might love riding in vehicles their whole lives, then as they get old and into their senior years, with failing health, suddenly become anxious when riding in a vehicle. That happened with my older sister Morgan. She traveled across the entire continent with Mommy for years in a truck with no problems, but once she hit 14 years old, she suddenly became unable to travel in a car without extreme anxiety. You just need to read your pet, and adjust things accordingly. Trust me, us dogs are very adaptive. Our main goal is to always be with you, so anything that you can do to ensure we stay with you safely...will make us happy. Do you have any additional tips or advice you'd like to share? I'd love to hear about it. Leave me a comment and I'll add it to the list. Great article Pixel! I get so upset when I see pets riding on the driver's lap. People don't think about the dangers of airbags. Pets should always ride in the back seat. Another option especially for puppies or excitable dogs like my little girl is to use a carrier. Great tips! Especially the one about all dogs being secured. It really freaks us out when we see pets sitting on the car driver's lap.